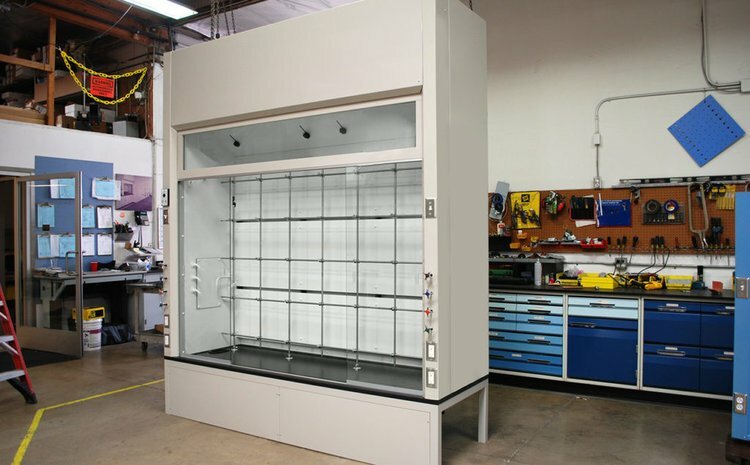 At Genie Scientific, we offer multiple fume hood designs tailored to use. For this article, Genie Scientific’s Vice President of Operations, Garrett LeVan, discusses the distillation fume hood building process and how to make sure the right aspects properly suit the needs of your lab. One of the main starting points when building a fume hood is the client’s interior working dimensions and the specific experiments needs, what the hood will be used for. From there we choose between a range of our custom or standard fume hoods. What are the specific offerings of a distillation fume hood? StillSafe ™ Horizontal sliding doors that hang from a heavy duty iBeam via rugged jump proof carriers for enhanced ease of use and safety. This significantly reduces the worry of broken or gunked-up lower track wheels. Powerlink™ A robust chain and sprocket sash counter balance system that we guarantee will never fail. SpillSafe™ Fume hood work surfaces are dished to safely contain spills inside the hood. AirDirect™ Distillation hoods are fitted with an aerodynamic airfoil to direct air across the work surface ensuring floor sweep for a safer operation. DirectConnect™ All of our hoods are fitted with a simple round exhaust collar for connection to building HVAC. There’s no complicated or expensive ductwork transition pieces needed, just a simple round connection. Does Genie offer different size options for a distillation fume hood? We offer our distillation fume hoods in five standard widths and four standard depths, so it gives the client a lot of flexibility even within our standard product. You can find a link to our specific sizing here. What is the most common sash type for a distillation fume hood? For distillation fume hoods, the two most commons sash types could be said as the vertical rising sash and the combination sash. The vertical rising sash is driven by Powerlink™ and it has dual framed pieces of laminated safety glass that move up and down. This type of sash allows for a threshold free access. The combination sash is also driven by Powerlink™ and consists of dual framed, vertical rising sash that also have horizontal sliding panes of safety glass. While our clients are able to choose from up to seven standard sash styles, we also offer customizable sizing and designs. After you pick your sash style, the next step is the interior liner material. This is the inside lining of the fume hood that comes in direct contact with the chemicals, vapors, fumes etc. that you’re working with during your experiment. Our standard liner material is our chemical tough fume hood liner. It’s a superior general purpose liner with phenolic resin and has excellent resistance to a broad range of chemicals; it’s also fire safety rated. This liner is structurally sound, so you can screw things directly into it and you don’t need to worry about damaging the hood. Is there a common liner for a distillation fume hood? No. The interior liner has to do with the type of experiment being performed and the chemicals that will be used, not the design of the fume hood. For a complete list of our liners, contact us today. What other variants do you need to take into account when creating the distillation hood? As with the other fume hoods, airflow is very critical. You must identify airflow requirements of the experiment, exhaust and the bypass type needed. We also ask our clients, no matter what kind of fume hood they are purchasing, to double check the maximum opening requirements. This is the unit measurement of whatever equipment is needed inside the fume hood. The set up position of your fume hood is when the horizontal sash is fully open, and the maximum opening measurement must match the measurement of whatever equipment will be needed for the experiment. Depending on your airflow needs and operating position, you then choose from two bypass types on your fume hood. There is the option of open bypass constant volume exhaust system, which is the most common for labs. The other option is a restricted bypass that goes with a variable air volume exhaustive system. A VAV (variable air volume) is an exhaustive system that typically maintains fume hood face velocity by adjusting lower motor speeds, in response to changes in sash position. This type is normally used when there is a multitude of hoods at a facility, as it becomes expensive to run on a singular fume hood. These above factors don’t necessarily depend on the style of the fume hood, so can be used on any of our standard fume hoods. What aspects affect the cost of the distillation hood the most? Since a distillation fume hood doesn’t sit on any objects, we can remove the cabinet accessories from the equations and move straight to plumbing and electrical necessities. Plumbing is very specific to the needs of your experiment and the location of your fume hood in the lab. You can read more about different service fixtures for all of our fume hoods here. As for electrical, we offer a standard package with all of our fume hoods. This includes a blower switch, a light switch, 220 volt GFI duplex, vapor proof T8 florescent light fixtures and an airflow alarm. This comes standard with all floor-mounted fume hoods and can wire to any junction box. We also offer explosion proof fixtures for class 1 division 1 environments.